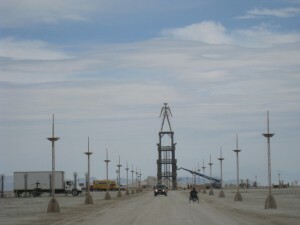 We arrived Friday evening a few days before Burning Man officially starts. As you can see from this picture, there are a lot of trucks and heavy machinery for the installations surrounding the man. Artists are working hard to complete their work. I woke up Saturday morning to take these pictures of the landscape. The weather was surprisingly cool. So cool that I walked all over the playa instead of riding a bike. I’d never experienced it so cool during the day in my nine years of attending.